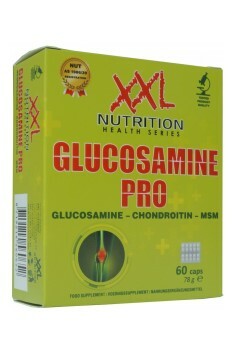 XXL Nutrition Glucosamine Pro is a comprehensive formulation designated for everyday supplementation with the aim to protect the osteo-articular system form the processes which lead towards its destruction or function loss. It also improves the skin, hair and nails condition as well as it supports the defensive functions of the organism. Glucosamine sulphate – a glucose derivative which has an amine group, characterized by excellent bioavailability. Glucosamine participates in the synthesis of the main component of bone and cartilage tissue – collagen, which is responsible for maintaining their proper structure. Its regular supplementation allows for the renewal of defects in articular cartilage, limiting inflammation and pain in its vicinity. Chondroitin sulphate is the most bioavailable form of a chemical compound, constituting the resistance tissues and belonging to the group of glycosaminoglycans. Its presence in the synovial fluid prevents form the friction between the movable elements of the joint. What is more, it participates in the synthesis of the components of the articular cartilage, giving it proper endurance. MSM, a.k.a. methylsulfonylmethane, is a substance with a multidirectional activity, not only in the area of osteo-articular system, but also systemically. In the synthesis processes it is a donor of sulfur, important from the maintaining the tertiary structure of proteins point of view. In the area of articular cartilage it has the ability to inhibit the inflammation through many molecular points of capture. The bones form various connections in the human organism. The movable ones are called joints. The allow for the smooth movement. In order to serve us for the longest time, it is necessary to maintain a good condition of not only bone and cartilage tissue, but also elastic elements of the joint apparatus composed of collagen and other connective tissue elements. Collagen is a protein with high mechanical endurance, ubiquitously present in the organism. Beside the well-known fact that it builds tendons and ligaments, it is one of the main organic components of bone and cartilage tissue. The process of its biosynthesis is complicated, and any deficiencies of "building blocks" that constitute it can result in the weakening of its endurance. In order to prevent these kind of situations, at some age, it is necessary to include precursor substances in the supplementation. One of them is glucosamine, which effects in this matter have been confirmed in numerous scientific publications. The condition of the connective tissue also improves the supplying methylsulfonylmethane with the diet, which is an organic sulfur donor that strengthens the binding of amino acids present in the collagen. Because of it, they form connections like in a solidly woven braid or rope. Along with the age, more often the damages to the articular cartilage are occurring. Most often, it is caused by the deficiency of the synovium, which role is to minimize the friction between the bone elements. This "lubricant" is a mixture of proteins from the group of proteoglycans and glycosaminoglycans, which include, among others, chondroitin sulphate. Its supply along with the diet can contribute to the increased production of synovial fluid. Osteoarthritis begins with the slow destruction of articular cartilage. This leads to the activation of cells responsible for bone resorption. The activity of proteolytic enzymes and free radicals results in the occurrence of local inflammation – it is manifested by redness, warming, but above all pain in the area of the damaged joint. Responsible for this are pro-inflammatory cytokines. It has been proven that the use of MSM clearly limits the expression of inflammation mediators (NF-κß factor, IL-1, IL-6 and TNF-α). In addition, cyclooxygenase (COX-2) is inhibited, which "exclusion" is the point of action of many drugs form the NSAID group. This comprehensive action of both components of the formulaiton allows at the same time for prevention of the occurrence of degeneration of the joints, as well as to inhibit the progression of the disease in more advanced cases. It is also worth mentioning the other advantages of the substances contained in the formulation. Particularly noteworthy is MSM, whose anti-inflammatory activity is not limited to the protection of the joints. By affecting the above-mentioned molecular mechanisms, it also suppresses the immune response in other tissues involved in inflammatory processes. In addition, it acts as an antioxidant, reducing free radicals in its vicinity. It restores the proper function of the immune system, protects against its hyperactivity and is part of the immunomodulation. Methylsulfonylmethane holds a role of a specific "key" for cells, because it affects the bioavailability of biologically active compounds – such as vitamins and minerals, but also helps in the removal of harmful metabolites. As a donor of sulfur groups, it participates in maintaining the good appearance of the skin, hair and nails, in which the concentration of this element is extremely high. To sum up, XXL Nutrition Glucosamine Pro is a diet supplement designated not only for elderly people but also for active athletes, who are exposed to degeneration processes of articular cartilage or want to support other tissues, by suppressing systemic inflammation processes. One tablet 2 times a day during or after a meal. The supplement is designated mainly for the elderly people or hard-training people, who experience pain related to the osteo-articular system or focus on the prevention of osteoarthritis. This formulation should be used regularly over a long period of time, because the glucosamine contained in it begins its activity after several months of use. It is also worth thinking about introducing vitamin C to the supplementation, which will support the process of collagen synthesis – the main component of connective tissue.